Let's talk about my favorite tiara from Monaco, shall we? 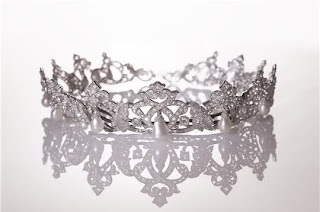 (This one makes my list of all-time favorite tiaras, by the way.) This tiara was made by Cartier Paris as a wedding gift for Princess Charlotte, mother of Prince Rainier, grandmother of Prince Albert. It was a gift from her husband, Count Pierre de Polignac (Prince Pierre of Monaco, Duke of Valentinois, as he became). The tiara is made of platinum and white gold, and features diamond scroll work with hanging pear-shaped pearl drops, which is why I'm choosing to call it the Cartier Pearl Drop Tiara. Princess Charlotte wore the tiara to an event prior to Grace and Rainier's wedding, but there are scarce images of her wearing it available. There are also no pictures of Princess Grace wearing it (apart from a painting which may or may not be it - only if a great deal of artistic license was used), so we jump to Caroline. 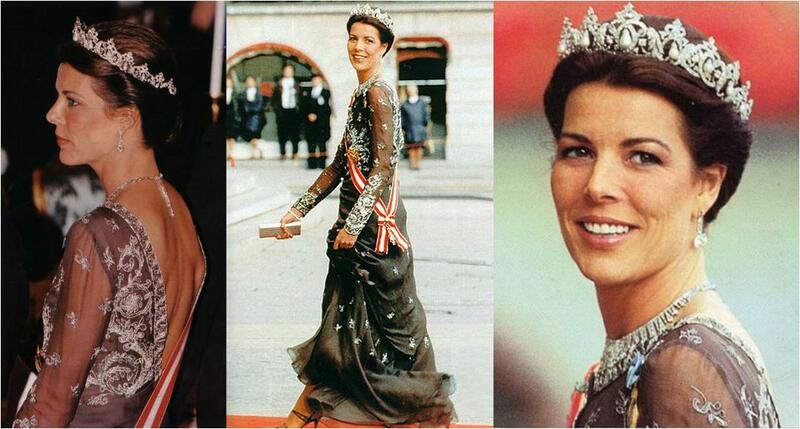 Princess Caroline hasn't even worn it that often, really just in the photoshoots you see here and for King Carl XVI Gustaf's 50th birthday celebrations in Sweden (above). Because Grace never wore the tiara publicly, many have assumed it passed directly to Caroline. Princess Charlotte was said to not have approved of Grace, so perhaps she did not leave her jewels to her daughter-in-law. I have no idea if Charlotte's will was ever public, which would be the only way to know for sure. And I think you have to consider that Charlotte died in 1977, and Grace died in 1982 - not giving Grace many years to wear it, if indeed the tiara did pass to her to stay in the reigning line. 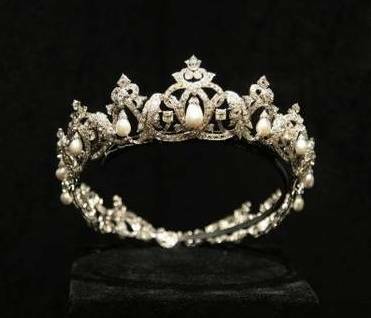 I have been told that exhibits showing this tiara have listed Prince Albert or the princely house as the owner. There are plenty of hanging pearl tiaras out there - I'm thinking of the Cambridge Lover's Knot Tiara, the Grand Duchess Vladimir Tiara, and Queen Margrethe has one as well - but this is my favorite. The proportions and the scroll work are just divine. I'm very much hoping, whatever the chain of possession may be, that this will find its way to Charlene's head in the future.